Representative Matt Gaetz (R-FL) schooled CNN’s Jake Tapper on the House Intel Committee memo so hard that Tapper changed the subject to accuse Gaetz of being a Nazi for associating with “racist,” “holocaust denier” Chuck Johnson of GotNews and a conspiracy theorist for going on Infowars. TAPPER: But Congressman, I want to ask you a question that is not actually relevant to this. I want you to be able to clear something up. Because people have been criticizing you for your personal behavior, for A, giving an interview to “Info Wars”, a conspiracy theory website that, as you know, puts out the horrific claim that Sandy Hook was a false operation and those were all actors. It’s just a horrible, horrible media organization. You gave them an interview. And then also you brought to the State of the Union, or you gave a ticket to somebody who is a fairly notorious racist and holocaust denier, who is so bad he was actually banned from Twitter. I want to give you an opportunity to clear up these facts. GAETZ: Certainly, Jake. I don’t just talk on platforms where people agree with me. I think it’s important to take a message even to people who say horrible, zany things. “Info Wars” is a platform that I think has spread lies and mistruths and I’m very critical of the work they’ve done. That said, people that watch that need to hear the truth. So, I’m willing to go on and discuss the truth on platforms that even spread conspiracy theories that I don’t agree with. As to the State of the Union, I mean I would refer folks to the statement of the individual that attended saying he is not a denier of the holocaust, not a white supremacist, detailing the donations he has given to the Simon Wiesenthal Fund to hunt down Nazis living double lives, bring them before courts so they can face justice. So again, I don’t agree with everything that Mr. Johnson says, I don’t agree with everything that “Info Wars” says. But I think that when we get into an environment where we only talk to audiences or people that agree with us, can I think we end up in a myopic state of politics and it really erodes public discourse and the ability to face facts with truth. TAPPER: Congressman Matt Gaetz, a Republican of Florida, thanks so much, always appreciate it. Coming up more on her special breaking news coverage. 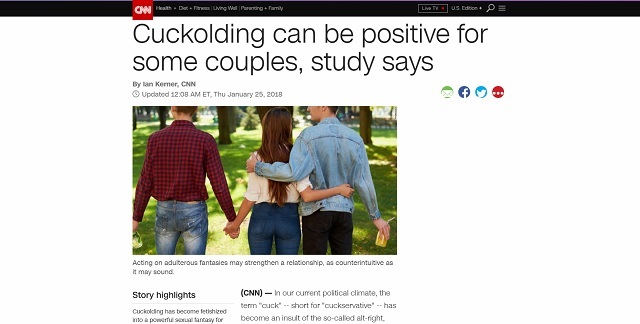 Just say the President of the United States of America went on Infowars and tell Tapper he’s on a network which literally promotes cuckolding. REP NANACY PELOSI (D), MINORITY LEADER, CALIFORNIA: If the president uses this fake, horrible release of distorted intelligence as an excuse to fire deputy acting attorney general, Rosenstein or Mueller, it could lead to a constitutional crisis. TAPPER: My next guest is one of the Republicans who championed the release of this memo, Congressman Matt Gates of Florida. Congressman, your reaction to the minority leader and the warning that the firing of Rosenstein or Mueller will provoke a constitutional crisis. REP. MATT GAETZ (R), FLORIDA: Well I don’t think it’s appropriate for Leader Pelosi or myself to give the White House advice on HR policy. I would extend an olive branch to Leader Pelosi and say this is the time for bipartisanship. We should evaluate the politicization at the highest levels of our government not in terms of existing facts but what to do going forward so that this type of thing never happens again. Republicans and Democrats are going to be in government and in power in the foreseeable future and I think it’s appropriate that the investigative processes don’t get tainted with these political considerations like they clearly were in this case. TAPPER: You say like this type of thing, you say political considerations are part of this case. How do you mean? GAETZ: Well the Democratic Party, the Democratic Party paid the Perkins Law Firm. The Perkins Law Firm paid Fusion GPS. Fusion GPS hired Christopher Steele, and Nellie Ohr. Christopher Steele wrote the dossier and then Kellie Orr’s husband, Bruce Orr, valeted that document into the Justice Department. Then it was so unverifiable that they had to use a Yahoo News article before a FISA court to validate it. That Yahoo News article was planted by Christopher Steele, the very author of the dossier. Jake, this is the first time in American political history that an opposition research document has been injected into the bloodstream of our intelligence community. That’s not a Republican or Democrat concern. That’s an American concern. And for just a moment in this town we would put down our partisan swords and work together. I think we could develop a process that the American people would have greater confidence in moving forward for Republicans or Democrats. GAETZ: It’s a staff memo. Devin didn’t write this memo. TAPPER: OK, the Republican staff. As you know the committees have Republican staff and Democratic staff. This could have been done in a bipartisan way. It was not done in a bipartisan way. In fact, Democrats submitted their memo to counter this. And that’s going through a process right now. It’s not being released at the same time. But I have to ask you, in this memo, it make clear that a counterintelligence investigation by the FBI began in July 2016, investigating George Papadopoulos. That’s of course, the former campaign staffer for the Trump campaign, who has pleaded guilty to lying to the FBI about his interaction with Russia. If that is the counterintelligence investigations Genesis — which it is according to the Devin Nunes memo, the Republican House intelligence committee memo — why is the idea that Carter Page, in October 2016, who had already been on FBI’s radar — we know he was surveilled in 2013, 2014. Why is that evidence that this entire investigation is tainted? [15:40:00] GAETZ: I would point to the statements of Andrew McCabe before the intelligence committee. Mr. McCabe said that the dossier was absolutely essential and but for the dossier, there would have been no FISA warrant to spy on Americans citizens. That’s particularly troubling in the context of the renewals though, Jake. Because as you well know these FISA warrants have to be renewed every 90 days. Even after the FBI terminates Christopher Steele because they’re mad at him for going and talking to the media and they deem him unreliable, they still repeatedly reauthorize the FISA warrant. And again, Andrew McCabe, not Republicans, you know but Andrew McCabe says but for the dossier, dad war would have never been issued, and certainly would not have been reauthorized. TAPPER: That warrant is what Nunes claims McCabe said. Papadopoulos, as we know, said something to an Australian diplomat about how the Russians had dirt on Hillary Clinton. We also know, according to the Mueller plea agreement with Papadopoulos that he had said that in, I believe, March or April, that he learned about this through a London professor who had relationships with the Kremlin. So, my only point is the investigation into collusion or whatever, I mean we don’t know when it is yet, if anything, that investigation began in July. You’re talking about a warrant in October. The investigation had already begun. GAETZ: Correct, Jake. However, if you take the entire universe with of Papadopoulos claims and you put them into a bucket, that bucket alone would never have functioned as a basis to continue this investigation. It may have been sufficient to start it. But it certainly would not have been a basis for the intelligence gathering and the continuation of that investigation. If I just said Jake Tapper is a bad guy and he colludes with Russia, that may be the basis to start an investigation into you, but it wouldn’t be able to be continued in the absence of actual facts. And unfortunately, instead of getting facts and getting a basis, there was a reliance on this memo from Christopher Steele that was so unverifiable, they had to use a Yahoo! News article from Michael Isikoff to be able to justify it before a FISA court. GAETZ: But McCabe did. We don’t even have to get onto that, Jake, because McCabe was aware of all those facts and he testified before the intelligence committee that this dossier was the proximate cause of these surveillance warrants. And that alone is far bigger than the Russia investigation, it’s far bigger than Donald Trump’s presidency. It goes to the very core of our democracy and whether or not we want to have political documents to serve as the basis to spy on American citizens. We should rise above partisanship and solve that problem. TAPPER: It’s an excellent question, whether or not it was just this political document. But FBI officials that we’ve been talking to and Christopher Wray, the FBI director himself, all of them saying that there is no way a dossier like this would be presented in a FISA court without corroboration of some of the things they’re talking about. GAETZ: Yes, but the corroboration was the Yahoo! News article. The corroboration for the dossier was a news article planted by the very author of the dossier. So, it becomes factual and logical and legal tautology. TAPPER: How do you know that? Have you seen the FISA warrant? GAETZ: Because that’s what’s in the memo. We should, honestly. GAETZ: It’s not a partisan memo. These are statements of facts. You should not characterize it that way. These are verifiable facts. And the letter I sent to Devin Nunes signed by over 60 of my colleagues calls for not only for the release of the memo but the actual supporting documentation. And I think it would be appropriate to redact sources and methods and dig further into how this happened. Because I think that will help us forge bipartisan consensus on how to make sure it doesn’t happen in the future. TAPPER: I hope that there is bipartisan consensus. The House Intelligence Committee historically has worked in a bipartisan way. There’s a complete breakdown in that. I’m calling this a partisan memo because normally the House Intelligence Committee and Senate Intelligence Committee they work together and put out a bipartisan memo. But Congressman, I want to ask you a question that is not actually relevant to this. I want you to be able to clear something up. Because people have been criticizing you for your personal behavior, for A, giving an interview to “Info Wars”, a conspiracy theory website that, as you know, puts out the horrific claim that Sandy Hook was a false operation and those were all actors. [15:45:00] It’s just a horrible, horrible media organization. You gave them an interview. And then also you brought to the State of the Union, or you gave a ticket to somebody who is a fairly notorious racist and holocaust denier, who is so bad he was actually banned from Twitter. I want to give you an opportunity to clear up these facts.